It is rare for a fighter to take the slow, methodical course in their career and even more rare for it to happen rapidly in front of the eyes of fight fans. It becomes nearly unheard of for all that to happen and for the fight community to be able to witness it all from the very start. One of the professional bouts headlining King of the Cage “Rumble” will deliver that rarity as Aaron Perls and Dorian Dixon make their professional debuts against one another inside the Crowne Plaza Casino this Saturday night on February 8th. Both fighters have been mainstays on the amateur scene around New Mexico and will culminate their experience as amateurs in a bout that encompasses experienced martial artists from Northern and Southern New Mexico as Perls represents Santa Fe and Dixon hails from Albuquerque. Equipped with some technical grappling and fluid striking skills, Aaron Perls will look to match Dorian Dixon and his similar skillsets. The Santa Fe Brazilian Jiu Jitsu trained Aaron Perls (pro debut, 4-0 amateur) is a very talented Jiu Jitsu practitioner and a very crafty Muay Thai striker. Perls has fought his entire career within the King of the Cage promotion and dates back to his very first fight in May of 2012. Training under well-accomplished Tom Pless in Santa Fe, Perls is well-known as a fight who can win on the feet just as quickly as he can on the ground. His last outing may have been his best to date as Perls locked up a fight ending triangle choke in 92-seconds from his back against grappling ace and Jiu Jitsu Black Belt Shannon Curlee. Dorian Dixon (pro debut, 5-2 amateur) is a seasoned veteran of the amateur ranks having fought for four promotions in seven bouts dating back to his debut in January of 2012 in a King of the Cage bout. Dixon mixes up time between Rosales Kickboxing and the Albuquerque Brazilian Jiu Jitsu Academy. 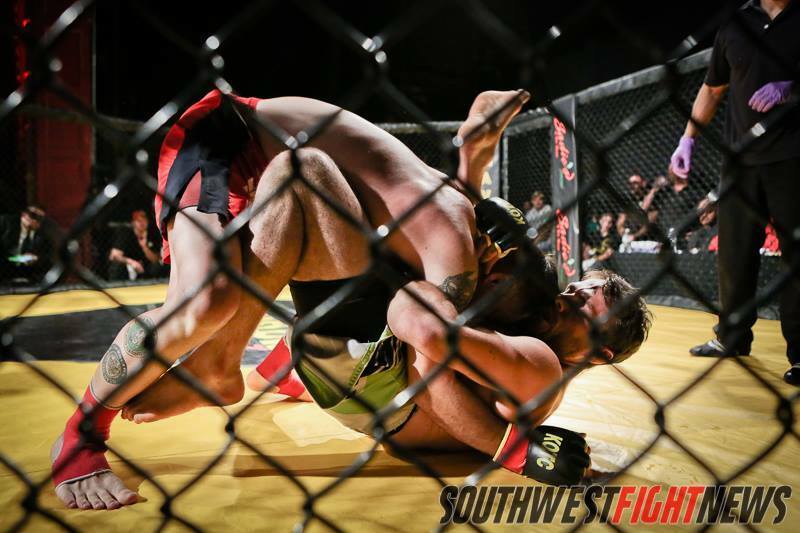 Dixon has showcased talents in every aspect of MMA from a methodical striking win over Ryan Fillingame to a defensive grappling showcase against Jiu Jitsu specialist Tim Valdez. Currently riding a three fight win streak, Dixon has won most of his fights by grueling judge’s decisions or submission. This fight has chess-match written all over it as both fighters are extremely polished on the ground as well as in their striking. The Jiu Jitsu academies that both fighters attend will definitely equip them to counter the other’s onslaught of grappling and Perls will put his Muay Thai on the line against Dixon’s very unorthodox and effective kickboxing talents. It should be a good one and could be a “Fight of the Night” candidate as both fighters seem to be very evenly matched. Stay tuned fight fans for more event coverage and analysis. We will be live inside the Crowne Plaza Hotel for King of the Cage “Rumble” on Saturday night. We encourage fight fans to come out to the show and for those unable to make the trip, follow our live blog on Saturday night and out Twitter feed which will have live updates. Follow our Twitter feed @SWFight.